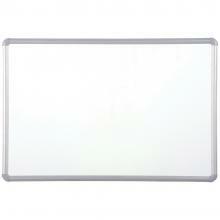 Beautifully crafted Magnetic Markerboard! Anodized Aluminum Trim and PVC coated steel writing surface are what makes this markerboard a great value. The anodized aluminum frame is rounded and trimmed at the corners with matching injection molded plastic corner pieces. The PVC coated steel magnetic markerboard surface erases clean with no marker ghosting.